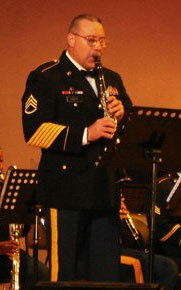 Richard Foote is a retired U.S. Army clarinetist. His U.S. Army band assignments include the Major Command bands at Fort Monroe, Virginia and The Army Ground Forces Band at Fort McPherson, Atlanta, Georgia, and a summer tour with the United States Army Field Band. He has studied with Patty Carlson of the Virginia Symphony, Dennis Zeisler at Old Dominion University, David Drosinos at Peabody Conservatory, and James Mark of Prince Edward Island Symphony Orchestra. In his retirement he plays with the Philadelphia Wind Symphony, The Pennsylvania Symphonic Winds, and The Virginia Grand Military Band.